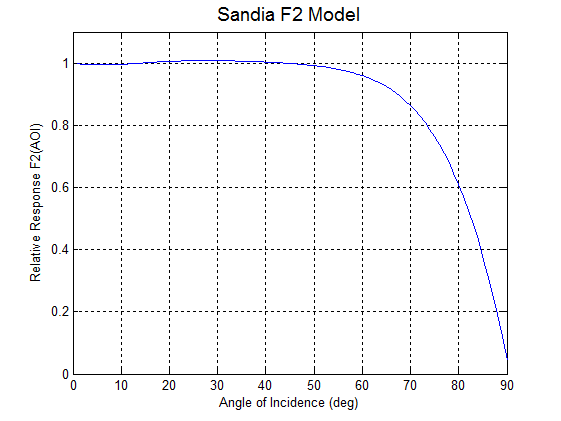 Sandia has suggested using a 5th order polynomial function to represent angular optical losses on short circuit current (Isc) . where the coefficient vector, , is determined from fitting experimental data measured outdoors. An example result of this model is shown in Figure 1. Note that the use of a 5th order polynomial causes a slight concave-up shape at low angles of incidence. This functional form actually results in values slightly greater than one for a portion of this range (10-45 degrees), and values greater than zero for 90 degrees. These non-physical features are downsides of this model.
. King, D. L., E. E. Boyson and J. A. Kratochvil (2004). Photovoltaic Array Performance Model. Albuquerque, NM, Sandia National Laboratories, SAND2004-3535.